By Romain Taravella & Laurent Marot. 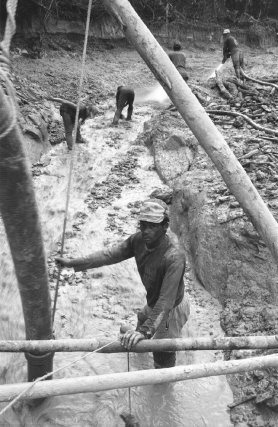 The tale of a few grams of gold and how it passes from a covert placer mine to Brazil through the informal economy before ending up in a jewellers’ via legal channels. Since the early 2000s the price of gold on international markets has shot up. The price of the precious metal has beaten new records every day over recent months due to the effect of the financial crisis. And people all over the world are scrambling over each other to lay hands on this buried treasure (in South Africa, Russia, the US, China, Ghana, Uzbekistan, etc.). In French Guiana people can’t move fast enough to get it out of the ground and sell it or trade it in, be it legally or illegally. The two motors are operating at full power in a deafening rattle on the edge of the ravine*. 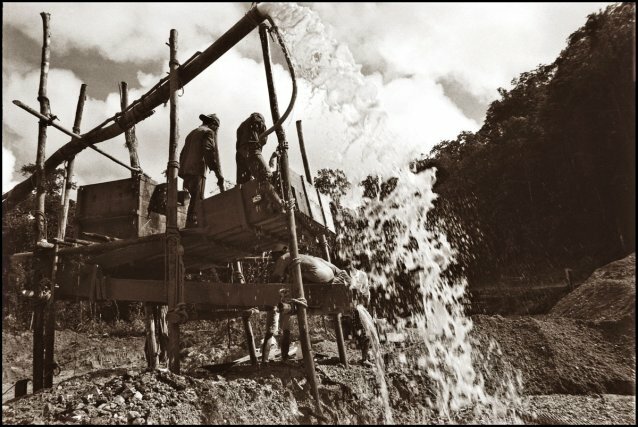 One of the motors is powering a large water cannon held at arm’s length by a man standing on the edge of the pit, directing the high-pressure water against the layer of laterite, turning the earth into the mud. The other machine is pumping the mud along pipes which take it to a sluice box further down that captures the specks of gold thanks to the mercury it contains. 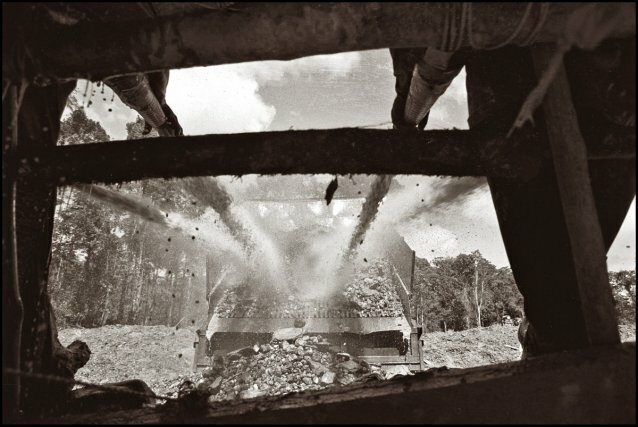 The team stops the machinery. José, the site manager, now starts collecting the gold. When heated with a blowtorch the mercury evaporates leaving only the precious metal. This week’s result is a disappointing “50 grams”, worth about 1300 euros. José sighs after weighing the gold on a little electronic set of scales. The three site workers receive 30%, or about 15 grams. The rest is for the boss, a fifty-three-year-old from Maranhao. He is a short smiley man whose face has aged prematurely due to two decades spent gold mining in Brazil and then French Guiana. “Everything has become very expensive what with police operations on the river, they seize the pirogues carrying supplies and food,” he says with a sigh. José has to pay the week’s operating expenses out of his share as boss, about 35 grams of gold. The main expenditure is fuel: “a 250-litre barrel costs 30 grams, but that can go up to 100 grams in the dry season when there’s not a lot of water in the river and it’s difficult to transport goods,” José explains. He says that the barrel lasts for one week. 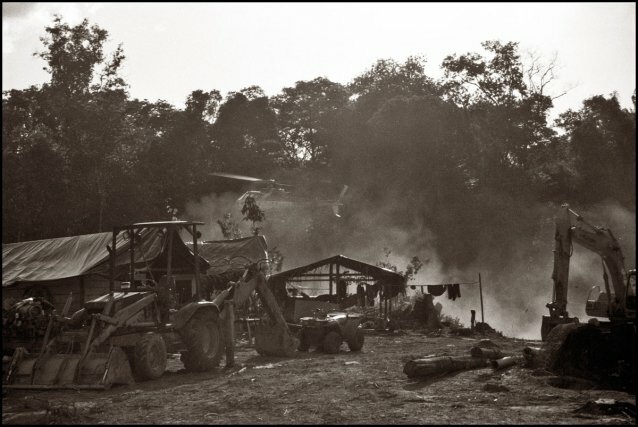 In addition to this is the cost of food for the whole team – the three workers and the cook on site. “A kilo of rice costs 2/10 of a gram of gold, or 5 euros,” he says. José also has to pay the porters or “petroleros”, so called because they carry fifty-litre drums of fuel (or anything else) on their backs. One trip, which normally amounts to a good day’s walk, costs 5 grams of gold. José is small boss on a modest production site for the seam has been exhausted. He does not have a pirogue or a quad bike like the larger illegal sites. Where logistics are concerned, everything is done by the “currutela” outfits, the name given to the clandestine villages which act as transits, supplies, and places for the entertainment of the garimpeiros. The nearest “currutela” is a five hour’s walk from José camp, on the edge of the creek. 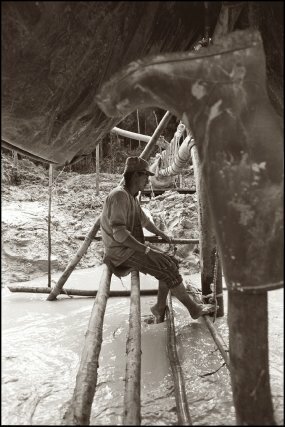 These traders act as intermediaries between the gold mines and Oiapoque, a town on the border with French Guiana, and one of the base camps for illegal gold mining. The next morning José and two of his workers jump out of their hammocks at dawn, pull their boots on, and set off down the quad trail through the forest for several dozen kilometres to the “currutela”. José has his 35 grams of gold in his pocket, and the workers weekly wages plus some savings. Then they arrive at the village, a muddy quad track with about twenty carbets on either side, groceries that double as restaurants, carbets to sleep, and then a carbet disco. The three men sit at a table in Lucia’s carbet, a forty-year-old dyed blonde with long legs and tight shorts. She is a respected shopkeeper in the village. She sells fruit and vegetables, meals – a plate of rice, red kidney beans, and chicken – for half a gram of gold, and fuel that she gets brought upstream on her own boat. José gives her 15 grams to pay for the food she had delivered to the site a few days earlier, plus 2 chickens at one gram a piece, six times the price at Oiapoque, the border town. Lucia takes the payment and checks it on her electronic scales. A bit later ten grams pass from Lucia’s till into the pocket of Valdo, her pirogue man, in payment for a night trip to carry freight from Ilha Bela, a place of transit for illegal workers, to the mouth of the Sikini river, further away from the border. José is sitting at a table in Lucia’s carbet restaurant with an old friend, Manuel, who he first met on the illegal mines in Saint Elie and on the Approuague. They talk about the “good old days” over a can of beer and a chicken with kidney beans: “do you remember that legal miner who used to sell us fuel on the Bélizon trail?” Manuel asks. “Yes, he used to sell so much of it that the police noticed and arrested him,” José says with a smile. The two men also remember another above-board mine operator who used to have them work on the sly as illegals, alongside his official operations, and pocketed the profits – in gold. “And at Saint Elie you could find everything you needed and the traders were all honest. And we could even sell our gold at the trading counters in Cayenne, no questions asked, we didn’t have to show any ID or papers,” Manuel adds. “I heard that the shopkeepers in Saint Elie were arrested last year and put on trial in French Guiana. And in Cayenne they have closed down most of the trading counters,” José states. In the evening Gordinho and Piaui, his two workers, go to the “cabaret”, in fact just a carbet with two long tables, benches, a big fridge, a flatscreen TV, a DVD player, and an enormous speaker belting out the worldwide hit by the French DJ David Guetta “I Gotta feeling”. And sitting on the benches tapping their feet in time to the music are four girls with miniskirts and plunging necklines ready to welcome the clients. “It’s three grams of gold, or five grams for the night,” one of the girls says. Gordinho and Piaui drink several beers at a steep price – half a gram for two beers, or seven euros each, seven times what they cost in the border town of Oiapoque. This is as far as José’s goes, but not his gold. The boss’ 20 grams will travel with a garimpeiro going back to Oiapoque the next day. They will be handed in at the gold counter which lent some of the money for purchasing José’s two machines (700 grams of gold) in the Jumaq store on the edge of the river at Oiapoque. The trading counters made the loan but with a steep interest rate. “It’s the last payment,” José says happily on his way back by foot to his mining sites in the forest, while the gold continues to follow its dual course, both official and unofficial. 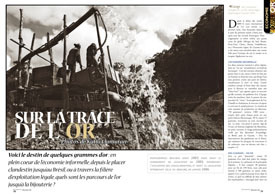 Once it has been bought by one of the gold counters at Oiapoque, the gold illegally mined in the Forest of French Guiana is declared “Brazilian produce from Oiapoque” at the local Receita Federal do Brasil tax office in Oiapoque, even though there are not any mines there. It is nothing short of the laundering of illegal merchandise, and is permitted by the Brazilian Federal State which takes a cut of 1% in tax. Overall figures from Brazilian Customs show that seven tonnes of gold were bought by the counters in Oiapoque between 2003 and 2008. This figure is a lot lower than the real amount of gold in transit through the town since the gold counters in Oiapoque only declare between one third and one half of what they actually buy, according to a study carried out by the WWF in 2009. The rest is therefore sold under the counter to unofficial buyers and then sold on elsewhere in Brazil. 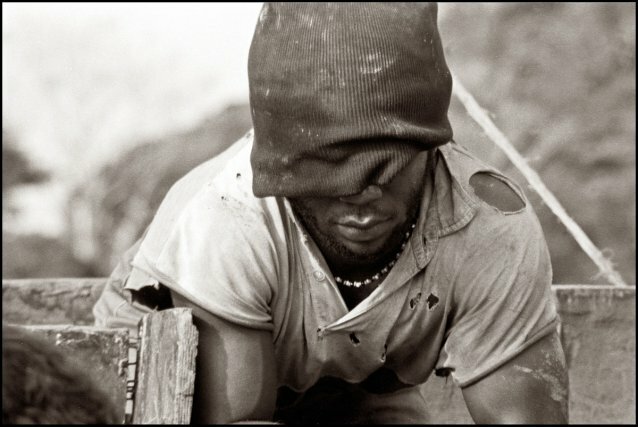 Given the absence of any procedure to certify the origin of this precious metal, the gold of José and the thousands of garimpeiros in French Guiana can end up on the international market, in the reserves of the Federal Central Bank in Brasilia, or else in the jewellers of northern countries. Unlike José and his fellow adventurers legal mine operators are careful to respect the rules fixed by the State as far as possible. 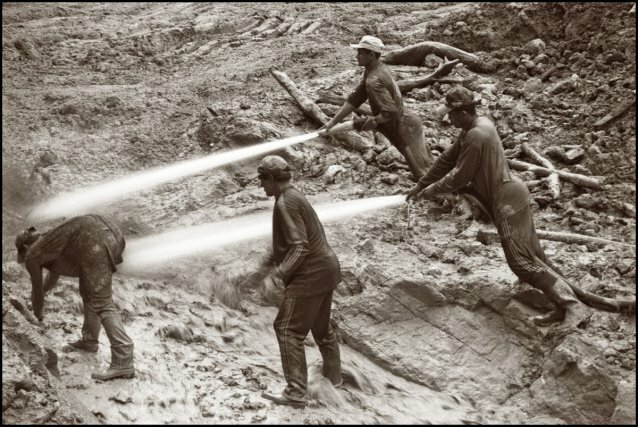 The way they mine alluvial gold has thus had to change and adapt. Since 2005 the “traditional” high-pressure water jets have been replaced by hydraulic shovels. Since 2006 mercury has given way to vibrating and centrifugal tables, which separate the gold from the gold-bearing sands by gravimetric processes (cf. preceding article). “We have become the greenest gold miners in Amazonia,” one miner says with a smile, summing up the technical shifts the sector has recently gone through. The vibrating tables can be minutely set to correspond to the exact particle sizes of the substrate, and once they have done their job the specks of gold that have been separated out are taken unobtrusively to the discreet gold counter in Cayenne. The trader who runs it also looks after the export paperwork, for 99% of the gold mined in French Guiana leaves the country. This intermediary makes life considerably easier for the small- and medium-sized companies which continue to mine gold in French Guiana. In less than twenty-four hours the specks of gold will have been analysed and payment made (in cash or by bank transfer), after checking the London “fixing” which gives the price of an ounce of gold in real-time. Unlike in mainland France, Guadeloupe, Martinique, and Réunion, the “Guarantee Law” (Articles 521-553b of the General Tax Code) does not apply in French Guiana. The trader therefore does not have any legal obligation to keep a register (“police book”) on the identity of his suppliers. Thanks to this loophole made especially for French Guiana, the affairs of José and Manuel have fine days ahead of them. Between 2000 and 2010, over twenty-two tonnes of gold exported from French Guiana were of dubious origin, the equivalent of a bit more than 4 million wedding rings. Currently there is only one gold counter officially operating in French Guiana, in Cayenne. It ships the entire production to mainland France where a refiner in Lyon is in charge of purifying the gold. Under surveillance and top security the gold goes from being 96% pure (on average) to 99.99% pure, and can then be described as “pure” as its “impurities “(copper, silver, etc) have been separated out. Refining as carried out today across Europe means it is hard to follow the precious metal. For technical and economic reasons gold from various places and different origins is melted down together to obtain a standard, anonymous product without any potentially awkward history: pure gold. “It is our job to purify the gold. […] The guarantee we offer our clients is that of top quality purification. That is what they want, they’re not interested in anything else. We certify the quality, and then as to whether the gold comes from French Guiana, Africa, that doesn’t matter,” a refiner explains. 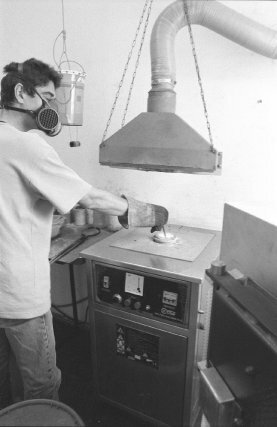 Once purified, the pure and untraceable gold is shaped into ingots, plates, wires, tubes, or grains (semi-finished products), or primers. Then the jewellery makers make their choice. In a family workshop in Aix-en-Provence everyone is busy carefully swaging, folding, filing, sawing, soldering, or melting the gold. “None of it is lost, everything is used,” the boss explains with a smile, pointing to the leather apron which means the craftsmen can recuperate each shaving and speck of the metal. There are grills across the plug holes of the sinks so as not to lose anything. Their overalls are all washed together and a grill recovers any specks which may have been caught in the folds of the fabric. The owner, a well-known manufacturer with a lilting accent, explains why he is worried, “Times are tough, really, and with the current price of gold the smallest piece is worth two or three times what it used to be. And who is going to get people to spend this extra money, given the economic crisis? You tell me that.” For he has to be able to pay all these passionate craftsmen. A tube of gold one centimetre in diameter is cut up every 3 to 5 millilitres to make wedding rings which then need to be polished. The precisely pressed and cut 0.8mm plates will form the shape and relief on a pendant in the likeness of Italy, Corsica, or the baby Jesus on a christening medallion. And where does the gold come from? What about the 22 dubious tonnes from French Guiana? “Well that really is not our problem, we can’t anything about it. That is French Guiana’s problem. We’re not responsible for everything that happens there – luckily enough,” the manufacturer admits.